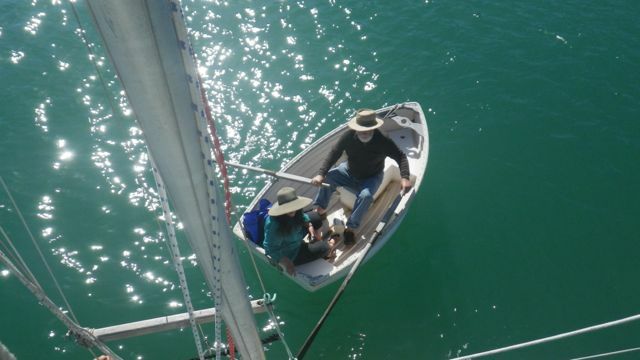 Karen and Jim's Excellent Adventure: Back to Sea! 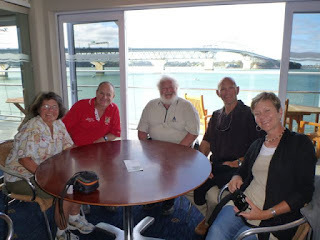 Auckland, New Zealand: We’re ready to go cruising again after a nice long break savoring shoreside delights, like ice cream on demand and hot running water and bicycles we can’t fit aboard the boat. 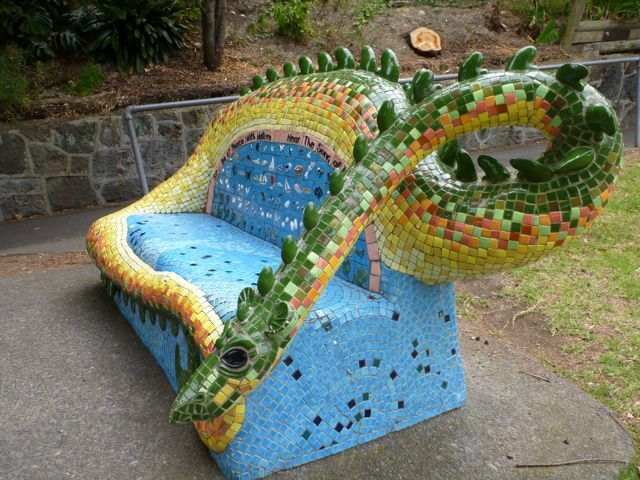 And park benches like this, of a Loch Ness-like creature called Ngataringa the Dragon. 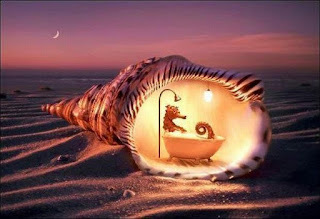 Coolest bench ever, no? 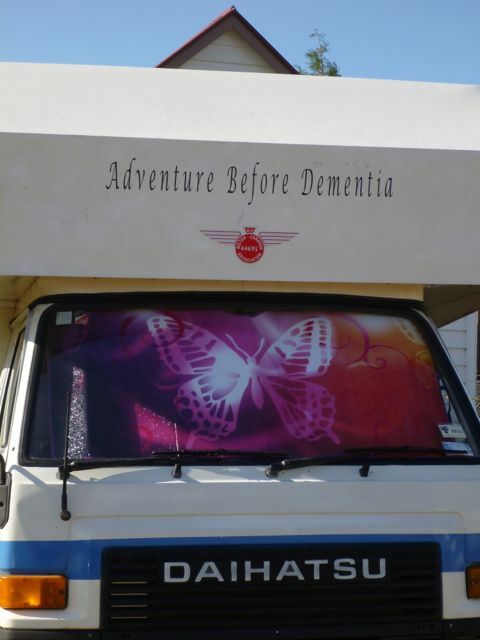 But we’re ready to head out again. 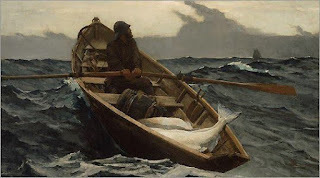 Leaving the flat tomorrow, sailing shortly afterward. 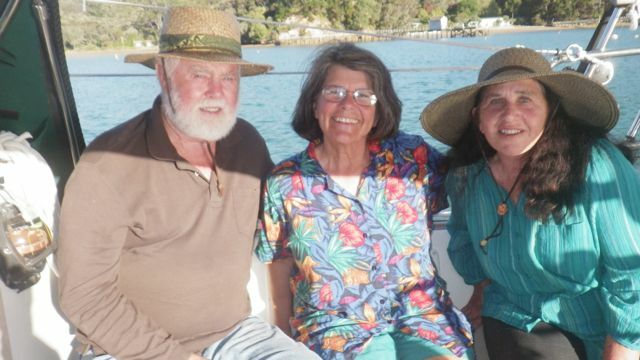 Great memories: Here’s a photo taken by Lin and Larry Pardey at Kawau Island as they rowed out to Sockdolager for a visit. For Lin’s excellent description of that delightful time spent visiting with them plus a cool story about long-ago cruisers, see their blog. You know it’s going to be a fun evening when you see this sight! 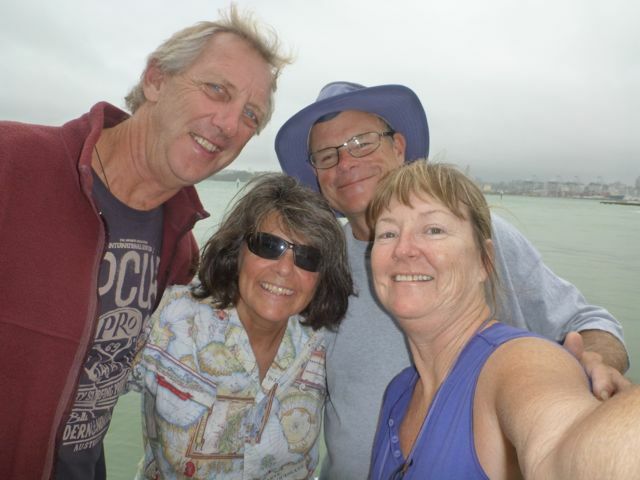 Some of the greatest joys of cruising are the friends you make, and one of the hardest parts is time and again seeing those friends disappear over the horizon, or sailing over it yourself. …and to see how many other reunions we might have among the islands and bays of the northeast coast of New Zealand’s North Island. 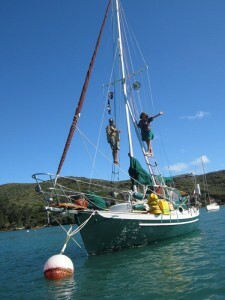 Kawau Island is calling us back! 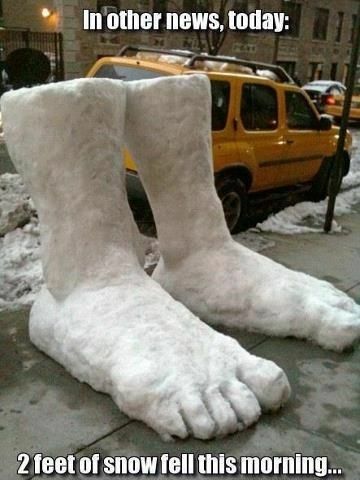 We would like to apologize to our New England friends who just got buried in an “historic” snowstorm with hurricane force winds that piled it up to something like eighteen hundred feet deep. 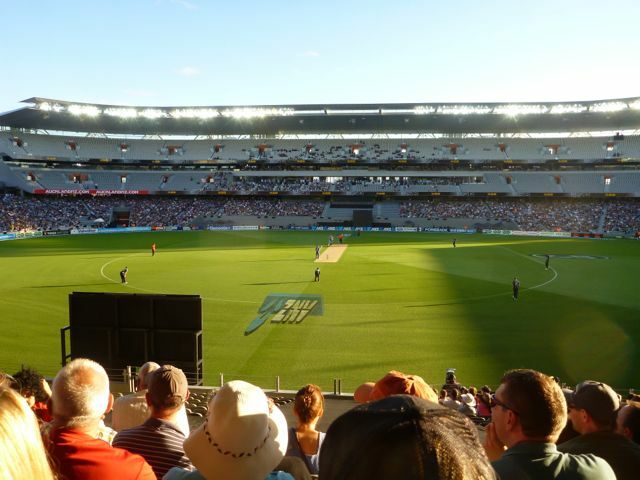 We are sorry to report that the weather has been fabulous excellent pretty darned good here in New Zealand. 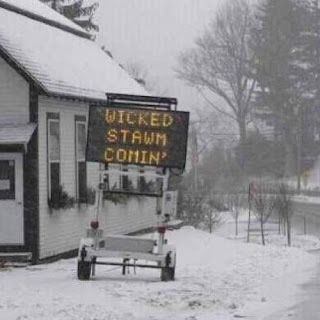 In fact, you New Englanders may wish to skip this entire post and all thoughts of it being summer someplace else, where some #%&! so-and-sos are actually outside in flipflops and having barbecues and going to outdoor cricket matches, for heaven’s sake. Speaking of cricket matches, England beat New Zealand in a game we attended with our Kiwi friend Chris Adams, but really, the loss was a mere flesh wound. EnZed will roar back. Right, Black Caps? Say you will. 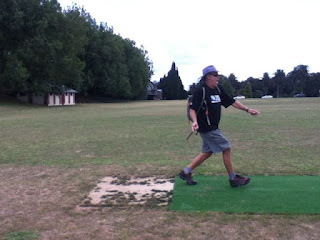 Jim had googled the rules for cricket and then, because he was so knowledgeable, he was invited right out of the Eden Park Stadium stands to bowl the first pitch, or whatever it’s called. Can you believe it? Neither can we. Just kidding. 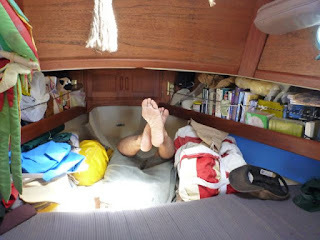 But he does exhibit astounding athletic prowess in the sporting activity known as “Boat Yoga.” Here he is in the famous “downward facing dog” pose, which is how you access a Dana 24’s extremely deep and commodious locker space. 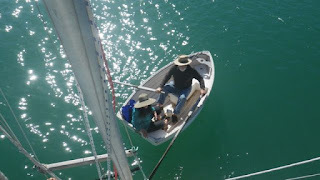 Part of why he had to do this was because our 23 year-old stainless steel water tank, which is in the bow section, had thoughtfully waited to spring a leak on a welded seam until a day before Jim and Tom arrived in New Zealand in December, and it had to come out for repair. Here it is all fixed up, sitting in the cockpit ready for re-installation. The repair is marked along the seam, and it should be good for many more years, we hope. Dana owners, be aware that the little ventilation tube up on the bow outboard of the water tank fill can, in very rough head seas on a starboard tack, admit small amounts of salt water back into the tank. 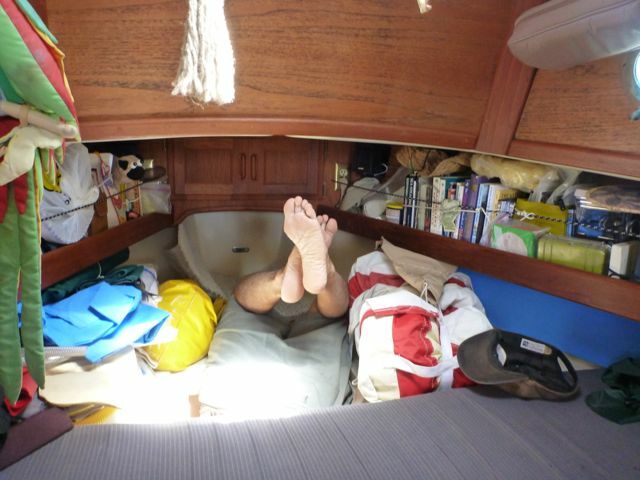 Although it’s rare, it happened to us twice on this voyage; once in the Tuamotus when we had to cope with a slightly brackish taste until we could refill, and again when Jim sailed from Vava’u to Tongatapu heeled way over in rough seas. The tube admitted enough salt water to require emptying the tank on arrival at Nuku Alofa. 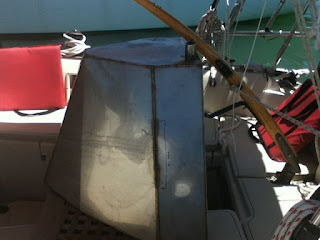 We think that Jim’s efforts to partially block that backflow with a porous sponge (hoping it would still let air in to equalize tank pressure) may have set up a partial vacuum in the tank, as the contents were sloshing violently around despite tank baffles, in the rough sea conditions just before reaching New Zealand. Jim has put a proper loop in the vent tube and is considering placing something over it that admits air but not water; possibly a piece of Gore-Tex. There seems to be nothing made commercially for this little issue. While we’re at it, click here for the most thorough review of a Dana 24 we’ve ever seen. Benjy’s web site has a wealth of information. We were dismayed to learn of the January 26 loss of the beautiful varnished yacht Echo. 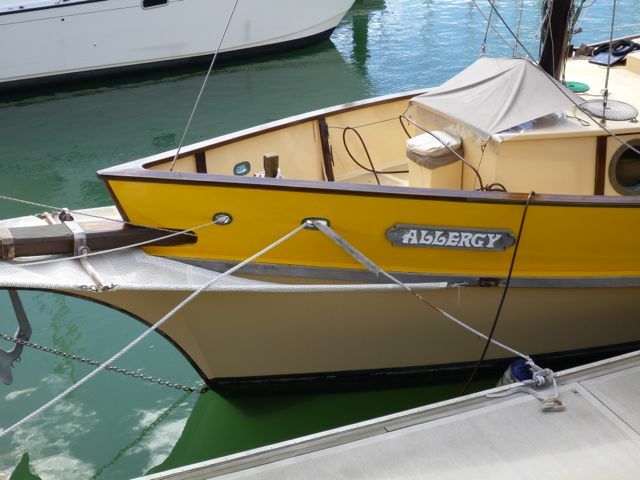 We remember meeting Rob, a former superyacht sailing professional, and his lovely Australia-bound yacht in Daniel’s Bay in the Marquesas, and we are saddened to hear that this well-found vessel struck an unknown object and sank after heroic efforts by Rob to save her. But we’re glad to know he was quickly rescued from his life raft. 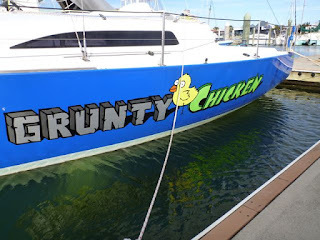 In upcoming posts we will be covering topics such as outfitting a small boat for offshore cruising; heaving to; and wildlife we’ve seen along the way. America’s Cup: Below is the Italian entry in the upcoming America’s cup race, Luna Rossa, being launched by crane for a sail. The number of restraining lines and boats with engines in full reverse keeping it from taking off like a spooked deer reminded us of that wild animal, which, if you think about it, is apt. 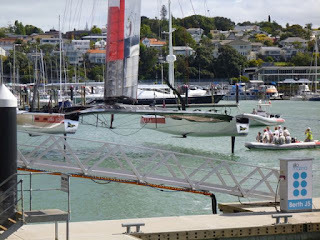 Any 72-foot “disposable” catamaran that costs $8 million and can go 40 knots and requires crash helmets for its crew is maybe a tad over the top in utter coolness, but it has more of a feel like NASCAR for billionaires. 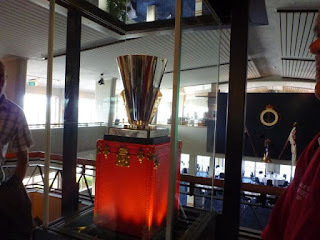 It would be nice if someday the America’s Cup went back to being a race among nations, most of whom can no longer afford to compete. And speaking of fabulous, we had a jolly time with renowned and beloved marine meteorologist Bob McDavitt over dinner at at the Royal New Zealand Yacht Squadron, with Mark and Michelle from S/V Cheers and their friend Richard, who runs boats in Antarctica and elsewhere. Bob, who often does forecasts for the America’s Cup teams and for westbound cruising boats in the South Pacific, is also doing daily weather forecasts for the very intrepid Jean Socrates, who at age 70 is well on her way, after three attempts, to sail solo nonstop around the world. Currently she’s off South Africa and will transit south of the world’s five great capes. Good luck, Jean! 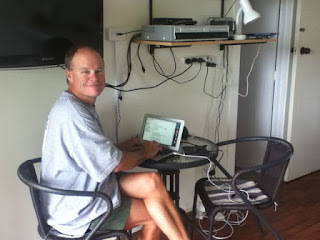 We first met Bob via his invaluable Weathergrams, to which you can subscribe via single sideband radio, and when we got to NZ we decided to meet the man behind all that enthusiastic weather knowledge. 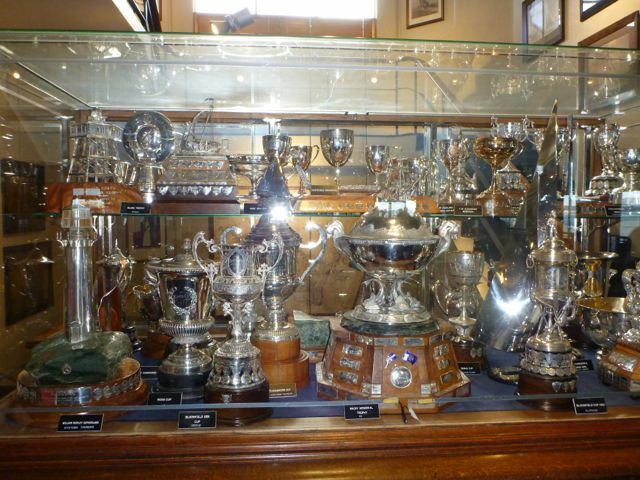 Here’s one of several jam-packed trophy cases at the RNZYS. They take not only their racing seriously, but also their polishing. 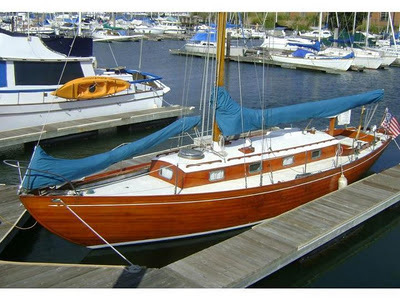 And prudent seamanship--they have some great sail training programs for kids. 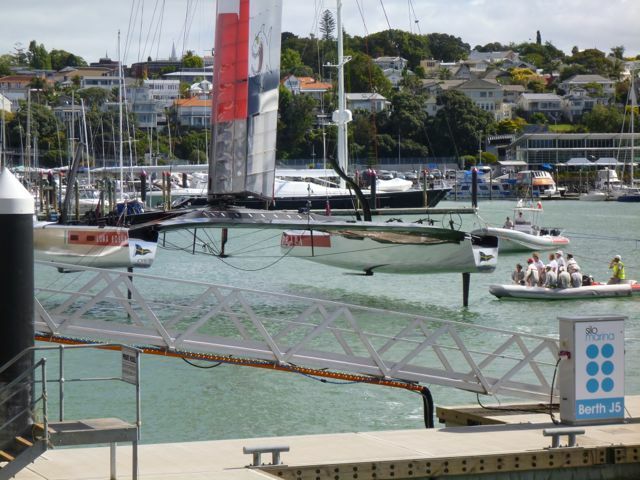 And here’s the spot where the America’s Cup once sat and may sit again, if NZ wins. 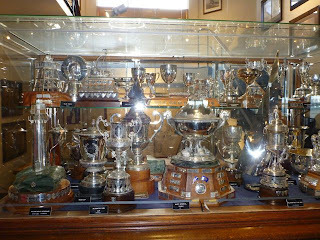 It’s protected behind smash-proof glass because some loony came in a few years ago and whacked the Auld Mug (first awarded in 1851) with a hammer, nearly destroying it. The trophy sitting in there now is the Louis Vuitton Cup. The America’s Cup is in San Francisco, and the competition trials start there in July, with the races being September 7-23. Some of the best coverage will be in Latitude 38 magazine online. It has been a restful, comfortable time in landlubberville, and we have made friends here, but we are looking forward to going out to busta wave again and get our sea legs back. 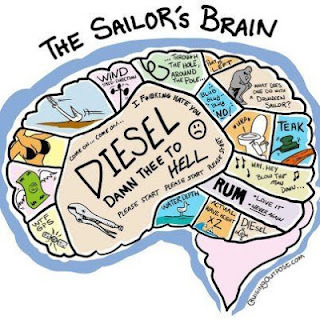 The reclaiming of our sailor’s brains (see medical diagram below) may take some adjustment. Except for the beer/rum lobe, of course, that one needs no tune-up. 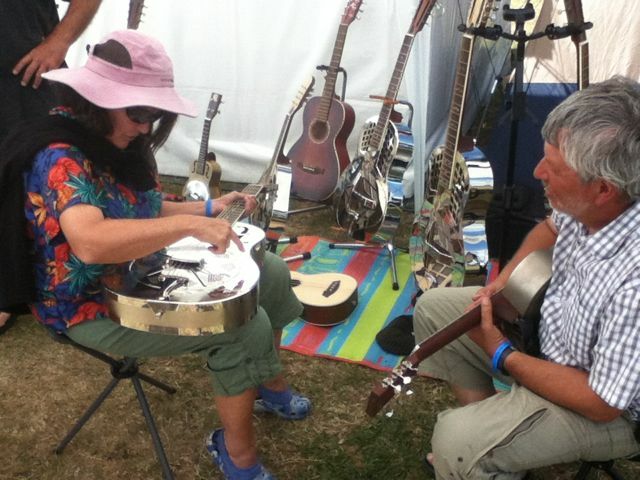 But first we need to tell you about the Auckland FolkFestival. In a word, it was a blast. 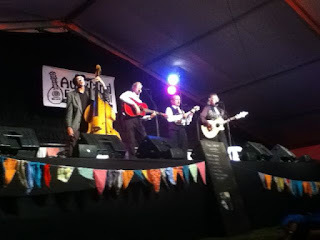 The music was excellent and the host, Roger Giles, is also the host at the Devonport Folk Club. His hilarious running monologue between acts kept everyone in stitches. 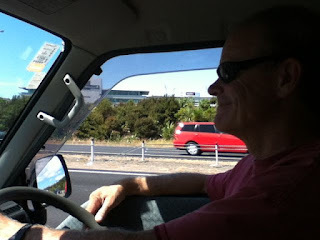 Here’s Jim driving our rented campervan to the Kumeu Fairgrounds festival site. 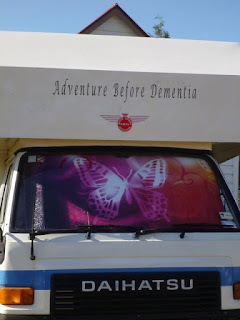 The van was comfortable and simple. And here’s another classic from the campgrounds. First thing Karen did was head for the guitar booths, and hoo boy, did she develop a powerful hankerin’ for a National steel guitar played dobro style. She didn’t intend to be such a participant but found herself onstage on Friday night performing two original compositions on her baby Taylor, and then on Saturday afternoon with a newly formed impromptu group dubbed The Vampire Cows From Mars singing the Leonard Cohen song “Hallelujah.” The entire audience joined right in on the chorus without a single prompt. We hope Mr. Cohen has an inkling of how much joy his song has given to audiences everywhere. 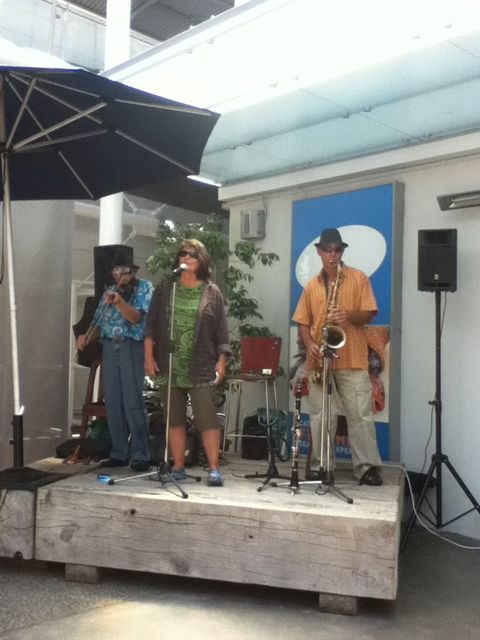 It was the festival’s 40th anniversary celebration, featuring all-NZ groups, and they were great. 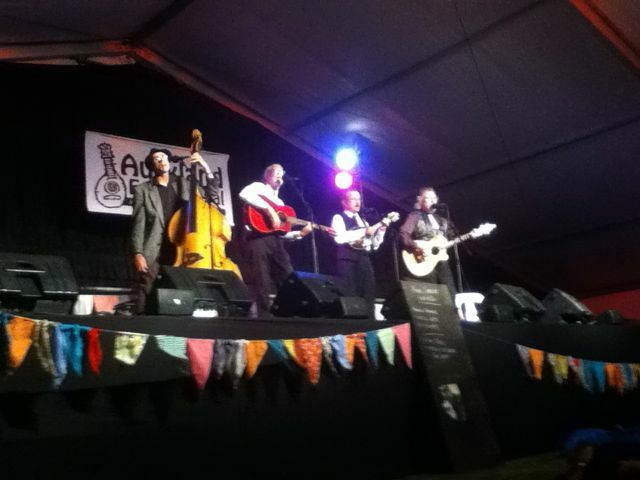 Here’s one of the headliners, a Dunedin-based bluegrass/humor/folk group called The Chaps. The day after the festival, we met our friend Chris in downtown Auckland, and on a dare Karen went up onstage with a small jazz combo to belt out “Cry Me a River.” Fun fun fun! 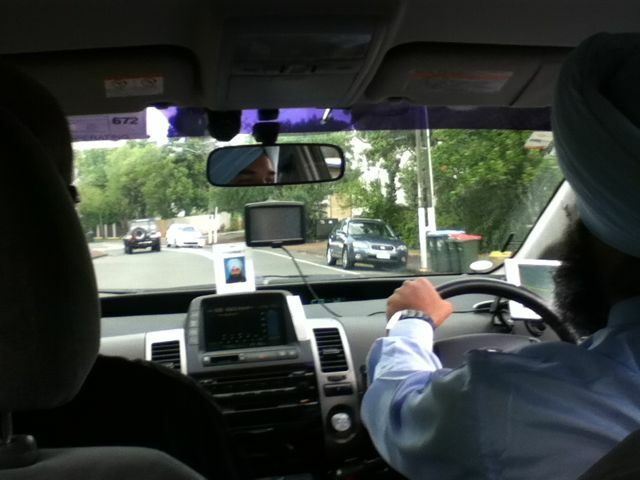 We always enjoy talking to taxi drivers, because most have unusual stories. This one in Auckland was no exception. We’ve gotten used to a lot of Indian names as there’s a sizeable Indian population and most taxis are driven by them, but when Jim saw this driver’s badge on the dashboard, he couldn’t help asking, “Whoa! Your name is Hyper486? What part of India is that name from? The driver replied, “Actually, that’s not my name. When I filled out the form I accidentally juxtaposed my name and my password. That’s my password.” Laughing, we asked him if passengers ever request his bank account numbers. 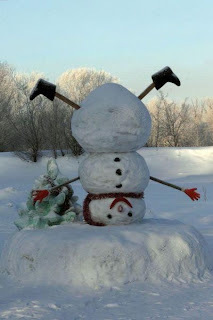 Good thing he has a sense of humor. Our friends Jon and Carol Dutton from S/V Arnamentia joined us for Pub Quiz Night at the Patriot in Devonport, which is housed in an old bank. Although we were unable to recruit any of our busy Kiwi friends to join us, WE STILL WON! By one measly point, but who cares? The prize was a $50 bar tab. 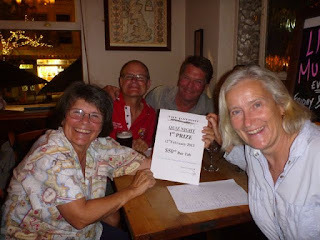 That’s two for two in pub quizzes; in a Niue pub we set a new scoring record. Maybe we should quit while we’re ahead? Team “Ocean Wanderers” proudly displays their prize. Karen would like readers to know that she does own more than one shirt. It’s merely a coincidence that the same shirt appears 3 times in this post, but at least it’s full of old maps. 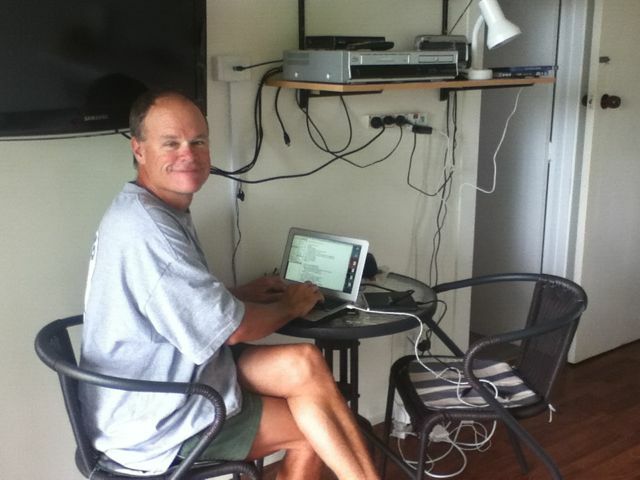 Meanwhile back at the flat, Jim got back into programming by designing an app that’s a GPS tracking analysis tool. 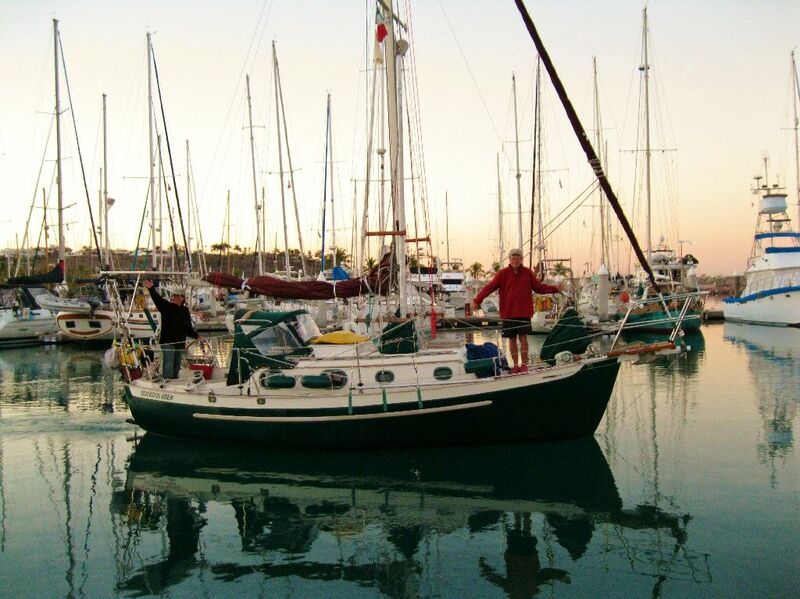 It’ll show things like how much time we spent going at various speeds across the Pacific, actual miles sailed, number of nights offshore, and other things. He will do a blog post about all that soon. Karen never knew he could speak Python. Here’s Jim letting his inner geek flag fly. Here he is posing as Karen lets her inner scientist flag fly at the Auckland museum. 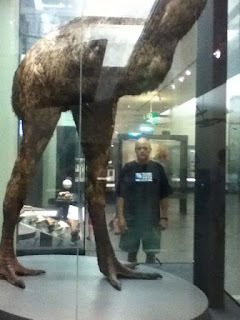 Had to get another photo of that awesome wooly mammoth of the bird world, the moa. Here’s a diorama of two royal albatross, which have 11-foot wing spans and can weigh over twenty pounds. Amazing birds. Can’t wait to start seeing and identifying seabirds again. 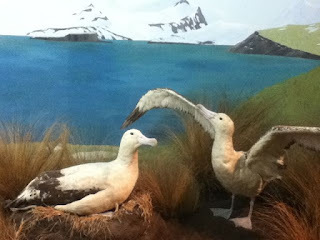 According to Karen’s friend Dr. Stuart Pimm, who, among his other accomplishments is president of Saving Species.org, New Zealand is one of the absolute best places in the world for that. Can’t wait! 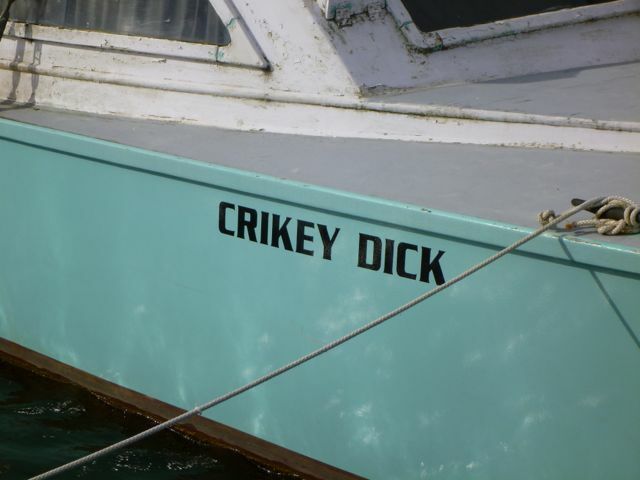 Have a great sail! We return to FP on Mar 2 and Estrellita a week later. You know the boat allergy had to be named entirely so they could call into work "sick" due to "allergy" and head out on the boat, right?